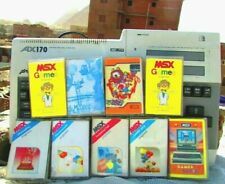 The only difference I can think of with MSX is that a lot of models have the AY capability built into the engine rather than having a seperate Yamaha chip (as in all Spectrum 128k models). Take a look at "Sample Tracker". I coudln't quickly find how it works though, but it seems to play samples on the AY and that is what is done in that "Byte Me" tune. Colemu: doesn’t really make a difference. The biggest difference is that on MSX, some models have the AY-3-8910 like the ZX, while others have the YM2149. The only difference between these chips is that the envelope generator of the YM has twice the resolution. That difference isn’t very obvious usually though. In principle MSX can play all ZX Spectrum music. I think once you try to play more channels, you may get into that “lofi distorted” territory that you mentioned. A lot of ZX Spectrum music is available in .AY format and can also be played on msx, f.e. with RoboAY for the PSG tunes. The game Ball Quest plays music this way. It's a well known method to use the envelope generator at high frequencies, to "sculpt" the PSG waveforms. Here you have a MSX example where you can "clearly hear drums and things like high hit-hat and close hit-hat, snare, etc. which you don't hear in MSX PSG game music! ". Some of those games mentioned in that video have a MSX version, you know. For example Auf Widersehen Monty. And yes, they sound very similar. The first song in the video is a special one, it's not really in-game and is about 37k. (It's not a very good vlogger.) I don't think anyone in the MSX scene would want to put a 36k PSG song in a MSX1 game. Ah the envelop, that vastly ignored of the PSG. The key to get exotic instrumentation, like used in the C64 SID, where the different wave forms were much studied. Using the envelop, we can get so many wave forms. From pure selecting one of the envelop forms, setting the tone values to 0 (to disable the pulse generation), or combine with a square form (setting the tone values). Each one with its own frequency value, so the possibilites are so large. Go to 2:04 and 4:46 for specially "exotic" ones, showing the good thing of the envelop usage. It uses the stereo trick output but is also fine if it would be mono. We can ear how we have the noise one (drums), the square one (the typical PSG channel), and the envelop one (the exotic instrument). Notice that the envelop one could be used in multiple channels (and is used in some of the examples before), but using the same envelop for both (could also vary the square parameter per channel in any case). The Atari ST and I think Spectrum have excellent PSG trackers.